Every year 15th February is observed as International Childhood Cancer Day. The aim of celebrating such a day is to create awareness in society about the curability of childhood cancer. In developing countries, the cure rates for children with cancer are over 75% with majority of them going on to live normal lives. Unfortunately 80% of the burden of childhood cancer is in developing countries and only 20% of these children get adequate treatment. Lack of awareness about childhood cancer and its curability is the main reason that many of these children do not even reach a cancer centre. 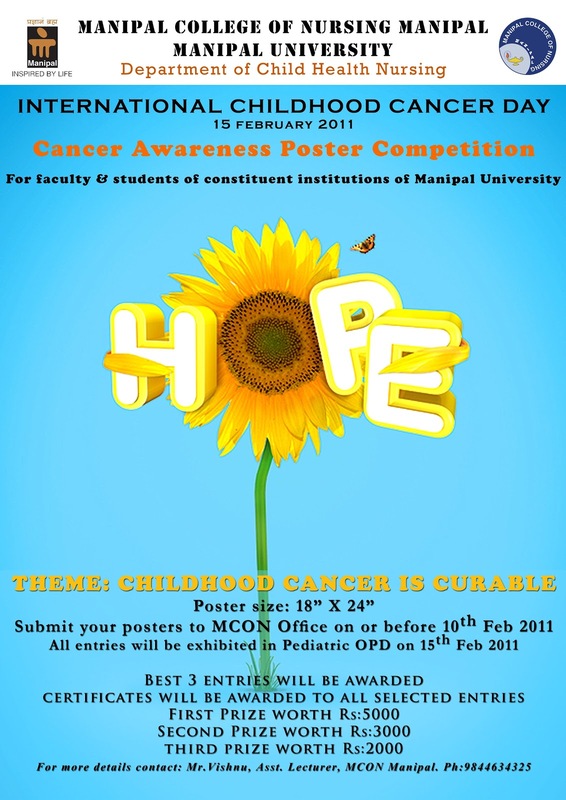 To increase awareness about the curability of childhood cancer, we have organized a Poster Competition. The theme of the competition is “Childhood Cancer is Curable”. Competition is open to all students and faculty of Manipal University. Poster size 18” x 24”. Please print your name, name of the college and contact number on the backside of the poster. Submit your posters to MCON Office on or before 10th February 2011 . All entries will be exhibited in Pediatric OPD on 15th February 2011. The 3 best entries will be awarded prizes. Certificates will be awarded to all selected entries.